I have been offering Intuitive Guidance for people both in groups and privately for about 5 years. One of the most common types of questions I get are from people that are needing to make decisions, choices or choose a direction to focus upon for their future. They are often trying the weigh the Pros and Cons of their options, or trying to figure out what the “best choice” will be. This uncertainty leads to stress, anxiety, sometimes sleepless nights. There is a very simple solution to this stress: “Listen to Your Heart”. “But How?” do you ask. So, what do we do? 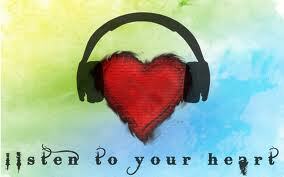 Yes, you are right, we need to learn to “listen to our heart”! And how, you ask, do we do this? For many of us, we are so used to thinking our way through life, that we are unaware of the more subtle feelings that give us very reliable cues. For some, you may feel sensation more in your gut, but in many readings the phrase that comes through, is “Your Heart is NEVER Wrong.” This may require a great leap of faith, especially if you don’t have a lot of information (or even contradictory information!) and so there are really two steps to this process. First of all, tuning in to our feelings, rather than our “head” and secondly, learning to trust what our heart tells us! Jill Bolte Taylor, author of “A Stroke of Insight”, describes in great detail the differences between the right and left hemisphere of the brain. The left hemisphere is the reason and logic, the home of the Intellect, while the right hemisphere is non-linear, visual and connected to everything – the home of our Intuition! Our Intuition speaks to us through our heart, our feelings. In one of my Tele-classes, I taught a technique to help tune in to your intuition. It is very simple, and easy to use every day. One of the most important reasons to practice using your intuition, is that from our right brain functioning, we access everything that affects us, not just the facts that we have. It is also a fabulous shortcut to cutting through all sorts of overwhelming information! I believe that many of us are out of balance in our use of our Intellect over Intuition. Life becomes easy, smoother and full of serendipity when we learn to listen to our heart, (i.e.our intuition) AND learn to trust it! What do YOU think? Do you have any stories of success (or not?!) in listening to your heart? I’d love to hear from you.